Shurtliff’s second fairy tale retelling, Jack: The True Story of Jack & the Beanstalk, is almost as popular as Rump. In fact, Jack is so popular that I haven’t had a chance to check it out for myself yet. So when NetGalley gave me the opportunity to read Shurtliff’s latest book, Red: The True Story of Red Riding Hood, I jumped at the chance. Those who’ve already read Rump know a little about the Red we meet in this novel. (She was Rump’s best friend, after all.) She is not like the Little Red Riding Hood we’ve grown up reading about. She is no sweet little miss who mistakes her grandma for a wily wolf. No, this girl is grumpy, self-sufficient, and crafty in her own right. But in Red, this young girl must face her fears while attempting to figure out what really makes someone into a monster. Red’s favorite person in the world is probably her granny. Some people call Granny a witch, but Red knows that Granny does whatever she can to help others. She’s even tried to help Red control her own magic, but that usually doesn’t end well. When Granny gets sick, Red vows to do whatever she can to find a cure for Granny’s illness, something to ensure that Granny will live forever. In her quest for a cure, Red meets another young girl searching for a magical elixir of her own. Goldie (better known to you and me as Goldilocks) is a hyper, chatty girl who Red finds annoying. Red tries to lose Goldie in the Woods, but a dangerous encounter brings the two girls together, and a rather unlikely friendship begins to form. Now, the two girls are working together to find something that will help Granny. They enlist the assistance of a rather reluctant dwarf who leads them to some possible “cures.” But Red learns quickly that these magical cures come with a price, a price she may not be willing to pay…even if it means making Granny well again. Throughout this quest, Red also finds herself growing closer to Wolf. She and this lonely animal share a special connection, and she soon realizes that he’s dealing with his own problems, namely a Huntsman who is feared above all others in the Woods. Red is familiar with the Huntsman and does not see him as a threat…until she and her friends get in his way. Can Red, Goldie, and Wolf escape the trouble following them? What will they encounter along the way? Will Red be able to find what she needs to help her Granny and face her own fears in the process? 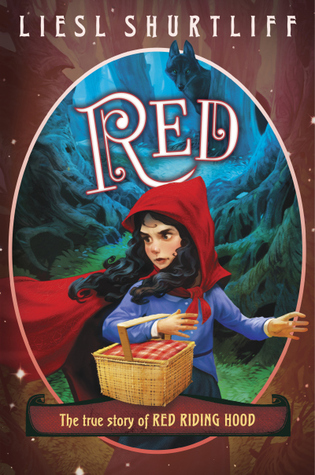 Forget what you think you know about Little Red Riding Hood and learn the real story when you read Red by Liesl Shurtliff! If possible, I think I love Red even more than Rump. Red is an awesomely complicated character who shows enormous growth throughout the course of the book. She goes from a grumpy, annoyed loner frightened of her own magic to a slightly less grumpy friend who faces her fears and is confident in her abilities. As if Red herself isn’t a big enough deal, don’t even get me started on all of the wonderful appearances from familiar characters. We have references to Goldilocks and the Three Bears (of course), as well as Snow White (who may not have been as beloved by the seven dwarves as previously thought), Rumpelstiltskin, Sleeping Beauty, and a fantastic twist on Beauty and the Beast. I’m sure there are more allusions, but I just can’t recall all of them right now. Suffice it to say, though, that readers will delight in making these connections, and they’ll learn that there may be more than one side to their favorite stories. For more information on Red and other works by Liesl Shurtliff, you can connect with the author on her website, Twitter, Facebook, and Goodreads. Also, check out the Red book trailer below. It covers a couple of things that I kind of glossed over in this post…and it’s really well done! I’m a big fan of fairy tales. I especially love it when these beloved tales get turned on their ears. Well, that’s just what I got in Rump: The True Story of Rumpelstiltskin by Liesl Shurtliff, one of the nominees for the 15-16 South Carolina Children’s Book Award. Now, the story of Rumpelstiltskin has never been one of my favorites, but I may have to revise my thinking after reading Rump. This delightful book shows readers just what life was like for young Rump, how his name and abilities caused him nothing but grief, and how he found a way out of quite the magical mess. As luck would have it, Rump has inherited his mother’s ability to spin straw into gold, but using such powerful magic comes with a price. And for Rump, the price is a seemingly unbreakable curse. A curse that leads to a horrible bargain with the miller’s daughter. A curse that drives Rump from his home. A curse that he’ll do just about anything to break. Rump goes on a quest to escape his wretched curse. Along the way, he encounters trolls (seriously misunderstood creatures), loads of pixies, a tree full of poison apples, and a family he never knew he had. He begins to realize just what his ability means and what it will take from him if he can’t get out of the magical, tangled rumpel he’s in. And, wonder of wonders, there might just be a way out of this mess, but will Rump find what he needs–his true name–before it’s too late? Will this boy finally be the master of his own destiny, or is he doomed to be just Rump forever? 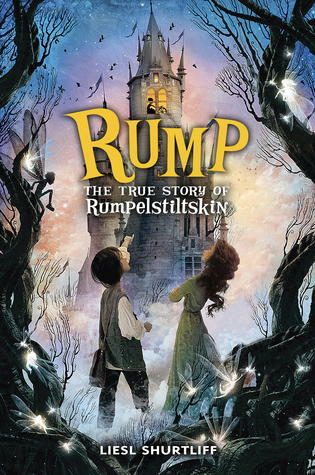 Find out when you read Rump: The True Story of Rumpelstiltskin by Liesl Shurtliff! Rump is a great fairy tale retelling because it fills in a lot of the blanks in the original story. I remember reading Rumpelstiltskin as a child, and I always wondered why this little man wanted a baby in the first place. Why did he agree to spin all that straw into gold? Why did the miller say his daughter could spin in the first place? Rump answers those questions and many more. If readers are paying attention while reading Rump, they’ll see nods to several other stories, the most notable being Little Red Riding Hood. (Red is Rump’s best friend.) 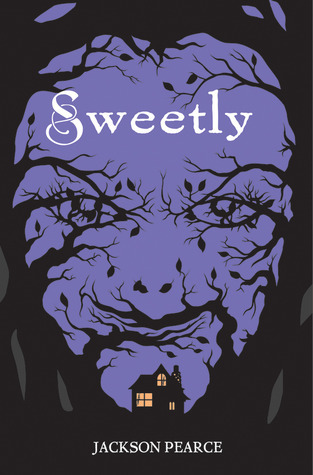 Some other stories that pop up–in one way or another–are Snow White, Rapunzel, and Jack and the Beanstalk (which is the subject of Shurtliff’s latest book). I think Rump is sure to be a hit with readers who love a good fairy tale, enjoy a bit of fantasy, and just want a good story. It’s great for readers in third grade on up, and I look forward to talking to my students about this enchanting story. I hope they are as fond of it as I am. For more information on Rump and other works by Liesl Shurtliff, you can connect with the author on her website, Twitter, Facebook, and Goodreads. You may also want to check out the fantastic Rump book trailer below! Enjoy! My favorite Disney movie is probably Beauty and the Beast. Like many bookworms, there’s one major reason for this. What girl wouldn’t love such an amazing gift?! Anyway, when I got the opportunity to read Serena Valentino’s The Beast Within: A Tale of Beauty’s Prince on NetGalley, I went in with some fairly high expectations…especially since the book is produced by Disney. Sadly, the book did not live up to those expectations. Parts of it were very good, but, as a whole, the book felt sloppy at some points, and the ending seemed rushed. I get that we all know how the story ends, but a book like this needs a little more than “The curse was lifted and everyone was happy. The end.” (That’s not a direct quote, but that’s definitely how the ending felt to me.) 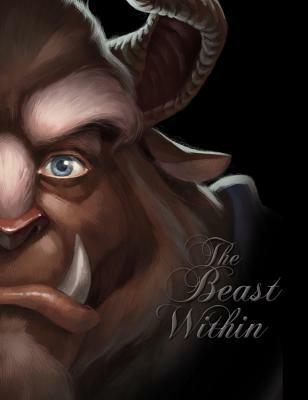 The book spent so much time relating the Beast’s feelings about everything, but we didn’t really get to see how he dealt with the curse being lifted. I’m assuming there was a bit of an adjustment period, and it would have been nice to see that. Gaston was the Prince’s best friend growing up. Both were arrogant jerks, Gaston often resented the Prince’s lofty station, and the curse gradually erased their memories of each other. I actually thought this part was kind of cool. While Gaston remained a jerk–and the Prince did too, to a certain degree–it was neat to see how each man grew into the man/monster we see in the movie. The story of the witch who placed the curse on the Prince/Beast was turned on its ear. Apparently, the Prince was engaged to a witch, broke the engagement, and the witch and her crazy older sisters used the curse to get revenge. And these sisters were CRAZY! They took revenge to a whole new level, and, while I appreciate how insane they were and how their actions impacted the Beast, I think this change-up actually detracted from the story I was looking for. It was a little unsettling. The curse had a sort of Weeping Angel effect on the castle’s household staff. (If that reference doesn’t make sense, watch the “Blink” episode of Doctor Who.) Gradually, the staff disappeared, but the Beast would often hear voices or see movement in the corner of his eye. When he looked for the source, though, seemingly normal objects would be frozen in place. Belle, however, could interact with the staff in their new forms. Anyone familiar with the movie knows this is a major change…and not a totally welcome one. I think The Beast Within has the potential to be a wonderful story, telling a beloved tale from perspectives we had maybe not considered before, but I do feel that there are some things that were changed unnecessarily. I also think that the author should veer away from “talking” directly to the audience. When one throws second person point of view into a story that should be totally third person omniscient, the waters get kind of muddy. I did enjoy the allusions to other Disney tales. At various points, references were made to Snow White, The Little Mermaid, Cinderella, and other classic stories. Readers who enjoy Once Upon a Time and other media that interweave popular tales will appreciate that aspect of this book. I’m hoping that a few of the things that bugged me will be changed before the book’s release on July 22nd. If they have, I’ll definitely consider purchasing The Beast Within for my school library. If not…well, we’ll just have to see. I’ve been kind of inundated with Peter Pan lately. Eighteen of my current students have been involved in a local high school’s production of the play. (Several former students were also involved.) For the past couple of months, all I’ve heard about is Peter Pan. The classic Disney movie has also been playing on cable. In this case, I decided to join in the madness by not only seeing my students in the play (which was fabulous, by the way), but I also moved Jodi Lynn Anderson’s Tiger Lily to the top of my reading list. Tiger Lily is dreading the day that she is forced to marry a man she despises, but she does have an escape from her worries. That escape comes in the form of a strange boy…a boy that her tribe has always thought is surely a monster. Peter Pan. With Peter, Tiger Lily can let her worries go, if only for a little while. She’s still holding parts of herself back, but she gradually grows to love Peter, his freedom, and even the Lost Boys who are always ready for a new game or adventure. Soon, the time will come when Tiger Lily will have to choose between her love for Peter and her duty to her tribe. Will she choose love over duty, or will that choice even be hers to make? Changes are coming to Neverland. Some of them are dangerous and have the power to completely destroy Tiger Lily’s life as she knows it. One such change comes in the form of a girl. Wendy Darling. Who is this dainty English girl who has so captivated Peter and the Lost Boys? How could Peter so easily forget Tiger Lily in the presence of this new girl? And what will Tiger Lily do to recapture Peter’s attention? How far is she willing to go–and what alliances is she willing to make–to get rid of this girl? Journey to Neverland to discover the story of Tiger Lily, the girl who first loved Peter Pan. Yes, this is a fairy tale in the strictest sense of the phrase. (It is told by a fairy, so there you go.) It may not be the happily ever after we’ve always expected, though. What really happened to Peter Pan, Wendy, the Lost Boys, Hook, Smee, and Tiger Lily? The answers may surprise you, but, I promise, you’ll never look at this classic story quite the same way again. 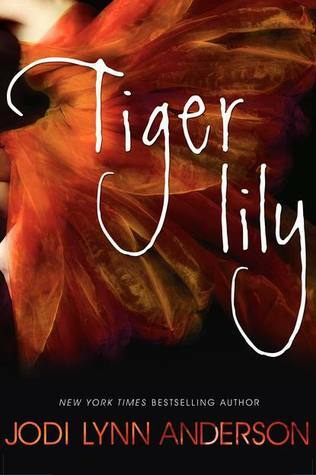 I always enjoy books–particularly YA books–with strong female characters, and Tiger Lily definitely fits the bill. At some points, Tiger Lily could even be considered too strong, and readers will want her to bend a little, but you have to respect someone who is so strong-willed. Tiger Lily was determined to live life on her terms, and, even when she did what others wanted, she still retained her will, determination, courage, and tenacity. Things didn’t always go the way she would have wanted, but Tiger Lily endured. Tiger Lily is told from Tinker Bell’s perspective, which I think is kind of cool. Tink, though she’s always been portrayed as totally loyal to Peter Pan, was a faithful companion to Tiger Lily in this novel. Yes, she did spend some time with Peter and the Lost Boys, and she even did a little recon to gain information from the pirates, but she always returned to Tiger Lily. In this book, we experience Tink’s frustration with the situations around her and how little she could do to change things. Tink sees and hears all, but she can’t really communicate that with the people she’s come to care about. It’s up to them to figure things out. For more information about Tiger Lily, author Jodi Lynn Anderson, and her other books, visit her Facebook or Twitter pages. I love a good fairy tale retelling. (That is clear to anyone who follows me on Twitter and sees my comments about Once Upon a Time every Sunday night.) I also enjoy really well-written science fiction. 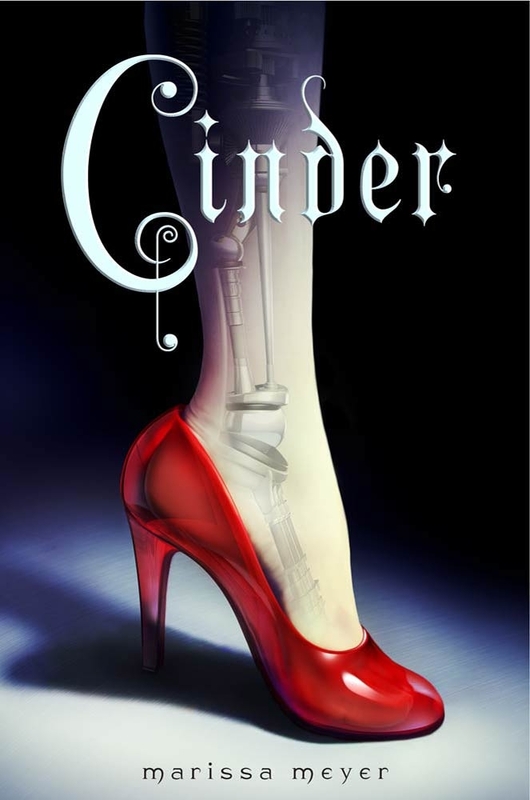 It should come as no surprise, then, that I found Cinder by Marissa Meyer to be a real winner. This book combines the classic tale of Cinderella with cyborgs…kind of Disney meets Terminator (or Battlestar Galactica). What more could a nerdy girl ask for? Cinder doesn’t have what one would call an easy life. Her stepmother treats her as nothing more than a slave. Everyone around her gives her a wide berth. But why? What’s wrong with Cinder? Well, she’s not entirely human. After a horrible childhood accident (that she has no memory of), parts of Cinder’s body were replaced with mechanical and computerized parts. Those around her consider Cinder, a cyborg, to be disposable and easily overlooked…unless they need something fixed, of course. Cinder has an uncanny ability to fix nearly anything that’s broken…and it’s this ability that leads her to an encounter with the Crown Prince of New Beijing, Kai. A devastating plague is sweeping across the earth. The emperor, Kai’s father, is in the final throes of the disease. Peony, Cinder’s beloved stepsister—and her only real friend—has just been infected. Cinder is blamed by her stepmother for Peony’s sickness, but even Cinder is not prepared for the lengths her stepmother will go to for retribution. Cinder is “volunteered” as a test subject for plague research. As everyone in New Beijing knows, this is a certain death sentence…one that Cinder has no intention of accepting quietly. As it turns out, Cinder will have bigger problems than being a glorified science experiment…for she is immune to the disease that is engulfing the world. How is this possible? What’s so special about Cinder, a cyborg that no one—except maybe Prince Kai—wants to befriend? Cinder soon learns that she’s even more special than her cyborg parts would indicate. She may, in fact, be the salvation that the entire world is looking for. As everyone knows, though, one person’s salvation is often another’s destruction. Who will ultimately be destroyed? Who will be saved? That answer may just rest with the decisions made by Cinder, a girl forced to deal with more than anyone should ever ask of her. What will happen? I’ll leave that for you to find out! I admit that it took me a little while to get truly invested in Cinder. About a quarter of the way through, though, I got absolutely hooked, and I couldn’t wait to get home from work to immerse myself in this story. 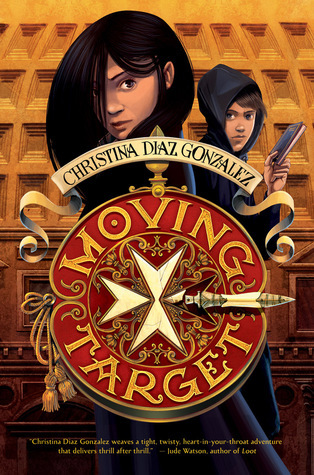 Yes, there was a ton of foreshadowing, and anyone familiar with the basics of the Cinderella story could predict what was going to happen, but there were a few surprises thrown in that made this an action-packed tale that, in my opinion, male and female readers could enjoy. Cinder is also a fine read for readers in middle school on up. I’m not one to pay a huge amount of attention to bad language in books, but I can’t recall much of it jumping out at me in this book. There was a sort of innocent love story in this book, but, again, there was nothing that really struck me as being inappropriate for middle grade readers. I love that, at its heart, Cinder is a science fiction book geared primarily toward teen female readers. For too long, girls (and women) who love science fiction have been bombarded with loads of male protagonists, but we’ve had very few—relatively speaking—that we as females could identify with. I hope many other authors will follow Marissa Meyer’s example and write quality science fiction with strong female characters! 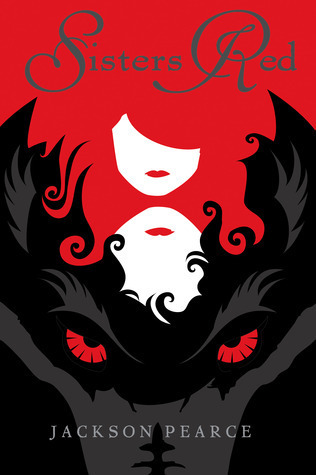 I look forward to reading more about Cinder in the next book in this series, Scarlet, which will be released on February 5th of 2013. 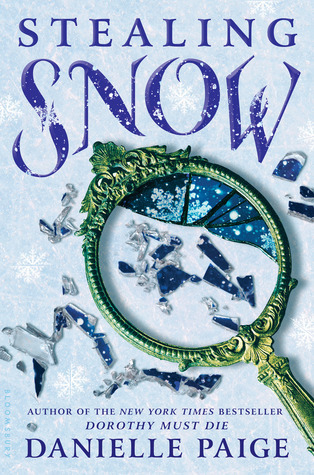 Book three, Cress, is scheduled for a 2014 release, and book four, Winter, is set for a 2015 release. There are also a couple of free ebook novellas that go along with this series. You can find more information about those on Goodreads. If I still haven’t convinced you to give Cinder a try, visit the author’s website at http://www.marissameyer.com/ for a closer look at this series. You may also want to check out the video below to hear author Marissa Meyer tell even more about this fabulous first book in the Lunar Chronicles.